Interchangeable Crimping U-Dies from T&B crimp terminals, lugs, C-Taps to 900 MCM and Aluminum H-Taps. Thomas & Betts Color-Keyed Shell-type dies are designed for use in the TBM14M Manual hydraulic crimper (#39205) and the TBM15 hydraulic crimpers (#39242). NOTE: The TBM15 requires the #39240 U-die Adapter in order to use the U-Type shell dies! Dies are made of hardened steel and are also color-coded for easy identification. Each die set produces an embossed Code# on the crimped lug or terminal to ensure a proper size crimp die was used. 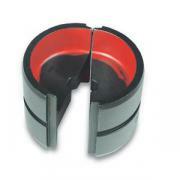 We carry T&B's full line of Shell-dies for terminals, lugs, C-Taps and H-Taps. See the tables below for details. Each die set is Color-Keyed for quick, proper die selection. Embossed Code # ensures a reliable and verifiable crimp every time! These T&B Die Sets are for use with Color-Keyed Terminals, Lugs and Copper C-Taps. These T&B Die Sets are for use with Color-Keyed Aluminum H-Taps.